I recently served as a member of the tasting jury for the renowned Concours Mondial Sauvignon competition; held in Buttrio in the Italian region of Friuli Venezia Giulia, this was the sixth annual tasting of Sauvignon Blanc from around the world. As a judge, I was part of a five-person jury, who would be assigned to taste about 35 wines a day; the wines were served blind- we did not know what country or region these wines were from. The only thing we were told was the vintage and the fact that the wines were oaked or unoaked. The panels were a nice mix of wine personalities from around the world; joining me as part of my team were a journalist from Italy, one from Luxembourg, another from Croatia, and finally, a winemaker from Spain. I met many of the other judges; there were winemakers and writers from France, New Zealand, South Africa and Slovenia, as well as a few other nations. I mentioned how we were not told the country or region of origin on the wines, but anyone with just a touch of experience can pick out most examples of Sauvignon Blanc from the Marlborough region of New Zealand's South Island. Perfumes of gooseberry leap out of the glass, with notes of passionfruit in warmer years, while there is tangy acidity and often a flinty note in the finish. Marlborough receives more sunshine hours than virtually any wine region in the world, so the fruit in these Sauvignon Blancs is quite expressive, indeed! I tasted five different cuvées of 2014 Sauvignon Blanc from Saint Clair Winery during one flight; these are rich, assertive wines, ones that are definitely not shy in their approach. I was especially impressed by the "Pioneer Block 1 Foundation" offering, which is very expressive with its powerful concentration, ripe gooseberry fruit and tangy acidity. However, at the end of the day, this is a rather showy wine - another winemaker from a different jury who tasted the wine wondered if two people could sit down and drink a bottle of this wine. I have to admit he was right- this is more of a wine made to show what can be done with the variety in this area, somewhat of a tasting wine, if you will. However, my panel was also impressed by this wine, as it did receive a gold medal in the final results. Interestingly, the same winery's "Wairau Riserve", also from 2014, was awarded a gold medal as well. This is a more toned-down style with beautiful harmony of all components, one that arguably would be a better option for two people for a dinner with shellfish or most seafood. Two outstanding wines - the wonderful 2014 vintage had something to do with the quality here as well - two different approaches, but beautiful varietal purity with both wines; Saint Clair doesn't receive the press heaped on other Marlborough estates for their Sauvignon Blancs, so it was nice to see them be awarded these gold medals (for the record, others New Zealand producers that received a gold medal in this competition were Clos Henri, Sileni and Stoneleigh). I also tasted two flights of Sauvignon Blancs from South Africa and came away impressed with some wines, but a bit puzzled with others. I must admit to not having tasted too many examples of this country's Sauvignon Blancs before, so I went in with eyes wide open - remember however, that we were not told that the wines were from South Africa when we tasted them and I did not correctly identify them when I was asked for my guess. My thoughts were primarily positive, as I enjoyed the structure and acidity of these wines; there were a few with muted aromas, but most offered bright fruit notes along with subtle herbal tones, resulting in very complex wines. One of my favorites was the 2013 "The Black Swan" offering from Steenberg, that was quite elegant with attractive spicy notes; this wine was awarded a gold medal by my jury. Other Sauvignon Blancs from South Africa that won gold medals at this competition were from the 2014 vintage from three other producers: Delaire Graff, Diemersdal and Mastricht. Finally, I have to report on the French wines I tasted, especially as the Loire Valley is the spiritual home of Sauvignon Blanc. I've always been a big fan of Sancerre; interestingly, I did not taste any in this competition. But I did taste several examples of Pouilly-Fumé, the other great Loire Sauvignon, and did I love these wines! Medium-full with notes of green pepper, asparagus and distinct grassiness with an assertive herbal note, these were classic examples of Sauvignon Blanc in my opinion. 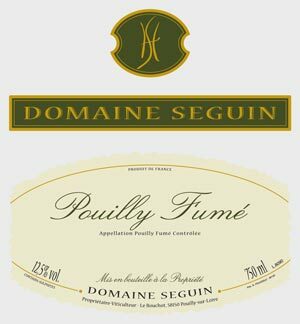 A gold medal award from our panel (and myself) went to the 2014 Domaine Seguin Pouilly-Fumé, a wine with excellent concentration and persistence as well as ideal ripeness; just a lovely wine with amazing complexity. Our panel also awarded a Gold to the 2014 Domaine de Riaux from Bertrand Jeannot, a Pouilly-Fumé that was less assertive than the Seguin, but no less delicious. Most impressive about these wines winning gold was the fact that the cold, rainy 2014 growing season in the Loire (as well as the rest of France and much of Europe) was rather difficult, to say the least. (Other gold-medal examples of Pouilly-Fumé were from the following producers: Bernard Petit & Fils, Jean-Pierre Bailly and Domaine Champeau). One final wine to comment on, the 2014 Domaine de L'Ermitage Menetou-Salon, which was awarded a silver medal. I was very high on this wine, giving it a gold medal score; regardless of its ranking, here was a classic Sauvignon Blanc with gooseberry and yellow pepper notes backed by excellent persistence and acidity. This has outstanding complexity as well as varietal focus and is a delight to drink. I have only had a handful of examples of Menetou-Salon, a small production zone south of Sancerre, but I will keep an eye open for more examples, as this was a terrific wine!